Fertilizing Crops, Feeding the World. Nitrogen gas reacted with Hydrogen gas produces Ammonia gas. But wait! What’s that sign in the middle? The double (⇌) arrows- state that this equation is revisable- it works both ways, the nitrogen and Hydrogen can be reacted to create Ammonia, and the ammonia can decompose back into Nitrogen and Hydrogen. The fact that this reaction is revisable adds a whole new dimension to this process; it makes it a lot more complex, revealing why it is so hard to manufacture ammonia this way. This will be explained further down. The two raw materials for the Reaction are obtained-nitrogen and hydrogen. They undergo a process known as “scrubbing”, where all impurities are removed from the gasses, and they are purified. Having been scrubbed, both gasses are mixed, and the mixture is piped into a compressor. Here, the mixture is compressed to a pressure of 200 Atm, which is 200 times greater than the pressure you are currently subject to on earth. This forces the temperature of the mix up, as the particles gain more kinetic energy- to about 300 degrees Celsius, causing the hydrogen and nitrogen molecules to split up. The compressed mixture of gas is then lead to a converter, where all the magic happens. The converter is a tank, heater to 450 degrees Celsius, and is pressurized at 200 Atm. Inside it, on shelves, lie beds of hot iron- that acts as a catalyst of the reaction, it speeds it up the reaction, but not participate in it. The nitrogen and hydrogen react at its surface to from ammonia-however not completely all of the hydrogen and nitrogen reacts together, and some of the ammonia created decomposes back to its constituents. As a result, only 15% of the mixture exiting the converter is ammonia. The mixture of hydrogen, nitrogen and ammonia is removed from the converter, and cooled, where the ammonia produced liquefies and is collected. 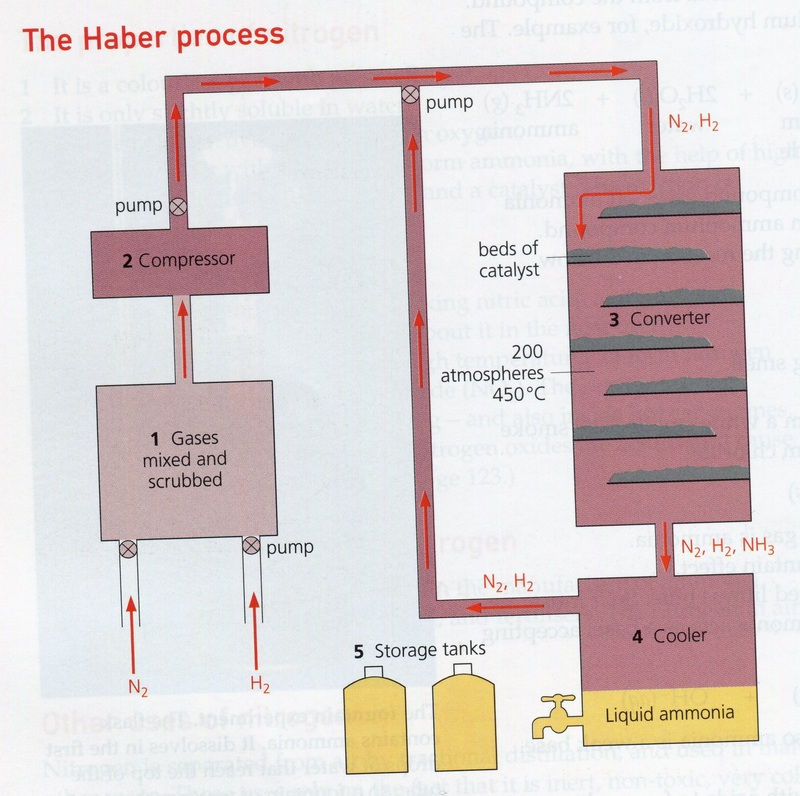 However the nitrogen and hydrogen remain as gasses- as they have lower melting points, and they are directed back into the converter for another chance to react, where steps 3 and 4 are repeated. Ammonia is collected in tanks as a liquid, and stored under pressure. Thanks a lot,the diagram makes perfect sense! Hey welcome to my little corner of the web. This site is dedicated completely to my chemistry assessment project on the Haber Bosch process, and how the world both benefits and suffers from it. Feel free to browse the tabs above, and please rate and comment.